Sport is adrenalin and the joy of competition. Team sports boost the feeling of togetherness. E-ball allows power wheelchair users to participate in a demanding team sport with a high fun factor. Anyone who participates in sports knows how inspiring and infectious the combination of physical activity and team spirit can be. For players in power wheelchair sports, the shared experience is most important. 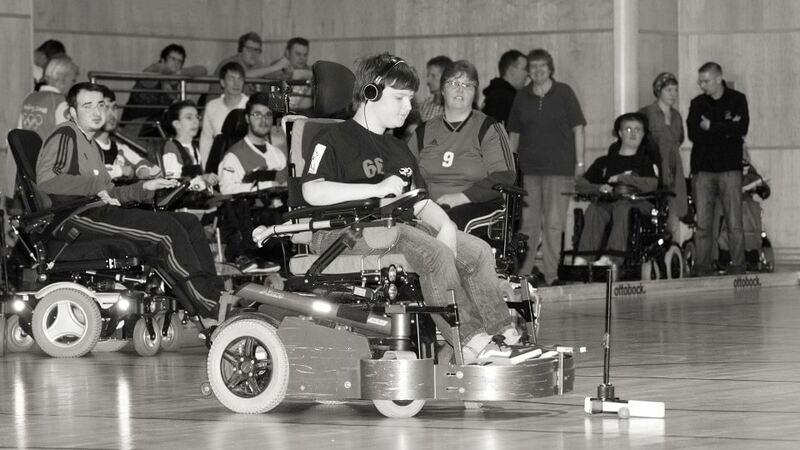 While the players operate their power wheelchairs in various ways depending on the degree of disability, the stick that is firmly mounted on the wheelchair gives everyone an equal chance. The 26-year-old e-ball player Willi says he gets completely absorbed in the fast-paced game. Next to fun and competitive spirit, power wheelchair sport is also an opportunity for him to satisfy his urge to move and occasionally release some aggression. "When I'm playing e-ball," says sports enthusiast Willi, "I can really feel untroubled and not think about my other worries." E-ball is an important element in the selection of sports for power wheelchair users, which has been rather limited to date. In order to allow as many prospective players as possible to participate, Ottobock among other things is involved in organising tournaments for this sport. The objective of regular meets is not only to promote competition between players, but also networking within the e-ball community.